Finding the Calendar Date From the Transit-Progressed M.C. Finding the Zodiacal Motion of Transit-Progressed M.C. or Asc. Finding the Motion by Declination of Transit-Progressed M.C. or Asc. THE most controversial of all astrological subjects relates to how much dependence can be placed on transit aspects. If an orb sufficiently wide is allowed, a transit aspect can be found that can be made to appear to account for every event of life. But when so wide an orb is used, some such transit aspect is present at all times, and there is nothing which clearly shows which of these numerous transit aspects indicates an event, and which does not. Under such circumstances the astrologer who has active extrasensory perception is able to pick the one which will coincide with an event. But those who rely exclusively on the aspect cannot do so; for while events do often coincide with transit aspects to birth-chart positions, innumerable transit aspects to birth-chart positions occur which do not coincide with any significant event. The Church of Light has never maintained that transit aspects have no influence, but it has taught that their importance has been greatly over estimated by some. 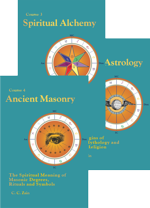 Furthermore, because statistical analysis of thousands of charts progressed to the time of an event indicates there is no need to consider them, the Hermetic System pays no attention whatever to the part of fortune, Moon’s nodes, progressed minor house cusps, or the Arabic or so-called sensitive points. Both in the birth chart and by progression it confines its attention exclusively to the positions of the ten planets, the midheaven and ascendant. 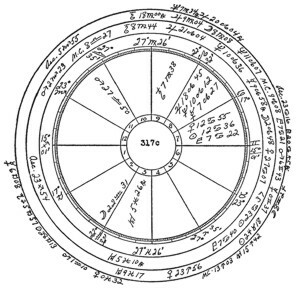 For predicting by natal astrology the events probable in an individual’s life it pays no attention to cycles or other such charts; having discarded their use after careful statistical analysis proved them often unreliable. It has found in addition to the birth chart the only reliable—and they are reliable—factors to be major progressions, minor progressions and transit progressions. Thus even as minor-progressed aspects have two distinct influences, so also have transit-progressed aspects. They exert a power, and a harmony or discord 1/365.25 of the power and harmony or discord of the same aspect between the same two planets when made by major-progressed aspect. The psychokinetic power of the thought cells receiving new energy through transit-progressed aspects thus enables them to attract into the life inconsequential events. Inconsequential events coincide with characteristic transit-progressed aspects. But in addition to this independent influence, if the transit-progressed aspect is to one of the terminals (as both birth-chart and progressed positions are terminals, unless a planet aspects its birth-chart place each progressed aspect has four terminals) of a major-progressed aspect, it has a trigger effect, tending to release either the minor-progressed aspect or the major-progressed aspect, or both. If a match is lighted in a room filled with cooking gas, neither the power of the explosion nor the resulting destruction is commensurate with the limited energy of the match. The power was there, and the flame of the match merely released it. The power which projects a bullet from a gun does not lie in the trigger nor in the finger which presses it. The power is in the powder. That power is released when the trigger is pressed. Until the trigger is pressed the power is not released. And we have ample statistical data indicating that transit aspects have very little power in themselves, but that they exert a trigger effect which tends to release the power of reinforced major-progressed aspects, and also the power of independent minor-progressed aspects. It will now be apparent why some think transits are so powerful. At the time they happen there is always a transit aspect within one degree of perfect involving the planets having an influence over important events. However, those who ignore major-progressed aspects, on an average miss one-half of such significant transit aspects; for the transit aspect to the major-progressed position of a planet is as powerful as the same transit aspect to the birth-chart position of the same planet. The main point, however, is that no transit aspect coincides with an important event in an individual’s life unless at the SAME TIME there is a major-progressed aspect involving the aspected planet which is reinforced by a minor-progressed aspect. To sum the whole matter up, nearly half a century of observation, and a quarter of a century of C. of L. statistical research, convinces us that for major events primary reliance should be placed only on the Major-Progressed Constants of the event. Minor events take place only during the periods indicated by minor-progressed aspects, and major events take place only during the peaks of power indicated by minor-progressed aspects which reinforce ALL the Major-Progressed Constants of the event. And the actual event takes place only when this reinforced power is released by the trigger effect of a transit aspect to one of the terminals of ALL the Major-Progressed Constants of the event. Symbolically, the Sun is the father and the Moon is the mother, “Male and female created he them.” In higher forms of life it requires the union of male and female to conceive offspring. The Hermetic Axiom, “As it is above, so it is below,” is thus verified still further by finding that both Sun measured progressed aspects and Moon measured progressed aspects influencing ALL its Progressed Constants must join in the production of a major event. In addition to gestation, however, before the event is born the energy must be released. It must become manifest on earth. As in human birth after gestation has been completed there must be the pains of labor or their equivalent before the child is released to take its own first independent breath, so in the delivery of any major event, after gestation due to major-progressed aspect and minor reinforcement progressed aspect, before the event is released in the physical world there must also be a transit aspect to the significant birth-chart or major-progressed terminal. The above rule enables us to eliminate the possibility of a given event or the commencement of a given disease, even during those periods while the Major-Progressed Constants are within the one effective degree of orb, and all are being reinforced by minor-progressed aspects, except during those limited periods when ALL these Major-Progressed Constants are also being released by transit aspects. It assists greatly in rectifying birth charts, as indicated on page of Chapter 8 (Serial Lesson 117), and it enables us more precisely to time indicated events; for the event will not only occur on one of the peaks of power indicated when ALL the Major-Progressed Constants are reinforced by minor-progressed aspects, but it will occur during one of these peaks of power ONLY at a time when there is also a transit aspect releasing ALL the reinforced Major-Progressed Constants of the event or disease. But thus to be sure they are eliminated during a given period, and that a certain type of event will not occur because the trigger effect is absent, not only the zodiacal transit positions of the ten planets and the M.C. and the Asc. must be precisely ascertained, but the declinations also of all twelve transit positions. Such precision also on occasions may be required to be sure that the trigger effect is present at the time the effort is made to bring some favorable event to pass. Experience proves that the aspects among themselves of transit-progressed aspects—the aspects formed in the sky—afford so little energy that, while they should be considered in starting ventures or in doing some important thing, otherwise their influence should be neglected. But as pointed out in Chapter 1 (Serial Lesson 19), transit movements through the houses, especially the slower moving planets through angular houses, should be noted. And especially the conjunction with, or opposition to, birth-chart or major-progressed positions made by the slower moving planets should be noted, in addition to the trigger effect of transit aspects in releasing reinforced major-progressed aspects or in releasing minor-progressed aspects. When we consider that the energy of a transit-progressed aspect is 1/365.25 that of the same major-progressed aspect, we are apt to jump to the conclusion that their influence is too small to be noticed. But the importance of an event attracted by psychokinetic power is not in direct proportion to the number of astrodynes of the planetary energy stimulating that power. When an individual has a number of major-progressed aspects involving the same planet, the accessory energy acquired by the thought cells mapped by that planet enables them to bring into the life an event more important than if there had been but one similar major-progressed aspect involving that planet. But if the energy thus received by the thought cells is five times that received under a single similar aspect, it does not indicate the event attracted will be five times as important. Experience indicates it is likely to be less than twice as important, and perhaps only one and one-half times as important. Under ordinary circumstances the resistance of environment to an inconsequential event is so small that even 1/365.25 the power of a major-progressed aspect, such as that of a transit aspect, may be enough to bring it to pass. But commonly the resistance of environment to really important events is so great that a similar major-progressed aspect may be able to bring into the life an event only a few dozen times more important. And five or ten times the power of a single major-progressed aspect may be able to bring into the life, due to the resistance of environment to more important events, an event not more than twice as important as one due to a single similar progressed aspect. Furthermore, the environmental conditions influenced by the inner-plane weather affecting the world, as indicated by the heavy aspects in the sky such as the oppositions and squares, and especially the conjunctions of the slower moving planets, and the inner-plane weather affecting nations, cities and groups of people as indicated by the major-progressed aspects in their charts of birth, have an important influence on the facilities for, or the resistance to, events indicated by progressed aspects in an individual’s chart. 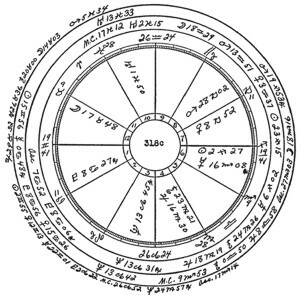 Our research department has observed that when drastic discords of some duration appear in the ephemeris, such as give a trend to world events of a disastrous nature, that the people through whom these world afflictions chiefly operate are those who have one or more of the planets involved prominent and severely unfavorable in their birth chart and by progression. If the heavy aspects in the ephemeris are beneficial, those who have one or more of the planets involved prominent in their birth charts, and making favorable aspects by progression, are those most benefited. The customary reaction of nations, cities, communities and other groups of people having a common governing authority is set forth in Course XIII, Mundane Astrology. 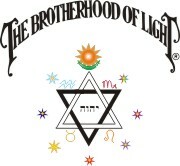 And the laws, customs, attitudes and fortune of the group to which an individual belongs must be taken into consideration as an environmental factor affording facility for, or resistance to, the psychokinetic power of the thought cells given energy by a progressed aspect to bring events into the life. As a concrete example, during both World War I and World War II we had opportunity to observe the influence of progressed aspects in the charts of a great number of people who were called into service. For people within certain age limits, who were sufficiently sound of body and mind, almost any major-progressed aspect involving Mars took them into the armed service and thus changed the whole course of their lives. And under a progressed aspect involving Mars that under normal conditions would have attracted only a slight cut or burn, many a fine soldier was slain in battle. People get acclimated to either customary outer-plane weather or customary inner-plane weather. Major-progressed aspects between the slowly moving planets last for years, and may last throughout the whole life. The individual adjusts himself to this continuous inner-plane weather and considers it normal for his life. But at all times it is within one degree of effective orb the major-progressed aspect indicates the inner-plane weather is such that, given sufficient accessory energy from another major-progressed aspect, or sufficient reinforcement by a minor-progressed aspect to one or more of its terminals, at a time outer-plane environment offers facilities for such an event, it may enable the thought cells to attract into the life a characteristic event. Thus, because an aspect has been within the one degree of effective orb for years does not indicate that eventually it will not bring to pass an event typical of it, or that precautionary measures relative to it should be neglected. 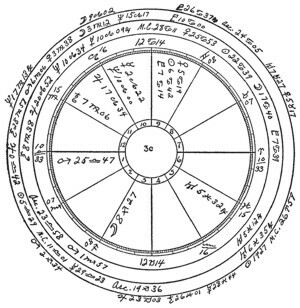 While knowledge of the birth-chart and progressed aspects as set forth in this course is of tremendous value, it is obvious that the more precisely the psychokinetic power of the thought cells mapped by a planet is known, the better the individual knows the manner in which his thought cells will react; and the more precisely their harmony or discord is known, the better it is possible to estimate the amount and kind of precautionary actions needed to enable the individual to direct his life so that events and circumstances will be to his advantage. And to give this precision of information, the relative amount of psychokinetic power is measured in astrodynes, and the relative amount of harmony or discord, and thus the strength of their trend to bring harmonious conditions, or the strength of their trend to bring discordant conditions, into the life is measured in harmodynes or discordynes. How to compute as so many astrodynes, the POWER of any planet, aspect, sign or house in the progressed chart; and how to compute as harmodynes or discordynes the HARMONY or DISCORD of any planet, aspect, sign or house in the birth chart, or the HARMONY or DISCORD of any planet, aspect, combination of aspects, sign or house of the progressed chart, are explained with examples in Course XVI, Stellar Healing, and are explained in greater detail in the reference book, The Astrodyne Manual. The object of the astrologer should be, not merely to demonstrate to his client and to the world at large how accurate in every detail his predictions are, but to be of as great assistance as possible to his client and to society as a whole. He should never forget, therefore, that people react markedly to suggestion. In fact, a positive statement made by a determined mind builds a thought form in the astral which works from the inner plane to make the statement a reality. This power of suggestion, consequently, and the will of the astrologer to bring constructive events to pass, may be made of great benefit. On the other hand, it may be made a force of great destructive power. The astrologer who predicts the death of an individual at a certain time, if the individual is aware of the prediction, may through suggestion contribute to the death. And even when the individual is unaware of the prediction, the thought form started by the astrologer, and added to by others who believe the astrologer’s prediction will be fulfilled, may be an active agent toward causing tragedy. Frightening people is iniquitous, because their fear attracts to them disasters that otherwise never would befall. I do not believe the astrologer ever is justified in lying to his client; but it is within his professional jurisdiction how much of what he discerns he will tell. And in what he does tell his client, he has the opportunity, and should use it, to impart advice and information in such a manner that the suggestive power, and the thought power, of his words shall be constructive and of assistance. The psychological effect of delineations and predictions should always be well weighed in connection with the temperament and probable reaction of those to whom made, before they are given. The transit-progressed positions of the planets for any time of day, on any calendar day, are found by calculating them exactly as if they were to be placed in a birth chart for that time of day on the indicated calendar day. By proportion, multiply (a) by (d) and divide the product by (c). This gives (b) the distance the planet travels during the EGMT Interval. By logarithms, add log. (a) to log. (d). The result is log. (b), the distance the planet travels during the EGMT Interval. (b) added to, or subtracted from, the Greenwich noon position of the planet on the calendar date gives the sign, °, and ′ it occupies at the indicated time on the given calendar day. If a major-progressed position is involved, find its major-progressed position for this calendar date. Find its major-progressed travel during 24 hours by dividing its travel on the Map. D. by 365. This travel is less than 1′ for all the major-progressed planets other than the Moon. Find (a) the gain in °s and ′s of the transit-progressed planet on the major-progressed position during 24 hours. If the aspect is to a birth-chart position, or to any progressed planet other than the Moon, (a) is the daily travel of the transit-progressed planet. Major-progressed Moon moves 2′ during 24 hours. Find (b) the °s and ′s the aspect is from perfect at the time of day represented by the ephemeris position of the transit-progressed planet. By logarithms, subtract log. (a) from log. (b). The result is the log. of (d). (d) found by either method is the EGMT Interval required for the planet to move from its ephemeris position to the perfect aspect. From the EGMT Interval find the EGM Time by subtracting a minus EGMT Interval from noon, or adding a plus EGMT Interval to noon. If the place is east of Greenwich, to find the Standard Time add the number of hours of the Standard Time Zone of the place to the EGM Time; but if the place is west of Greenwich, subtract the number of hours of its Standard Time Zone from the EGM Time. The result is the sought Standard Time (watch time). To find the Local Mean Time, multiply the number of degrees of terrestrial longitude the place is from Greenwich by 4 and call the product minutes of time, and multiply the additional number of minutes of terrestrial longitude by 4 and call the product seconds of time. This gives the time difference from Greenwich. If the place is east of Greenwich, to find the Local Mean Time, add the time difference to the EGM Time; but if the place is west of Greenwich, subtract the time difference from the EGM Time. The result is the sought Local Mean Time. Instructions for this are given in Chapter 2 (Serial Lesson 111). Find the calendar date in the ephemeris nearest the ephemeris time the aspect is perfect. If a major-progressed position is involved, find its major-progressed position for the calendar date. As the major-progressed travel is less than 1′ for 24 hours for all major-progressed aspects other than the Moon, except for the Moon, it may be ignored. Find (a) the gain in °s and ′s of the transit-progressed M.C. or Asc. on the major-progressed position during 24 hours. If the aspect is to a birth-chart position, or to any planet other than the Moon, (a) is the daily travel of the transit M.C. or Asc. Major-progressed Moon moves 2′ during 24 hours. Find (b) the °s and ′s the aspect is from perfect at the time of day represented by the ephemeris position of the planet on the given calendar date. By proportion, reducing (b) to ′s, multiply (b) by (c) and divide the product by (a). The result is (d). (d) found by either method is the EGMT Interval required for the aspect to become perfect. If the aspect is formed before the positions given on the calendar date in the ephemeris, this is a minus EGMT Interval on that calendar day. If the aspect is formed after the positions given on the calendar date in the ephemeris, this is a plus EGMT Interval on that calendar day. From the EGMT Interval find the Standard Time (watch time), or the Local Mean Time the aspect is perfect at the place the individual resides according to instructions previously given. From the sign, °, and ′ of the transit-progressed M.C. or Asc. find the declination as if it were a birth-chart position, as explained on page of Chapter 3 (Serial Lesson 112). Instructions for this are given in Chapter 3. Find the calendar date in the ephemeris nearest the ephemeris time the aspect is perfect. If a major-progressed position is involved, find its major-progressed declination on the calendar date. As the major-progressed travel by declination is less than 1′ during 24 hours, it may be ignored. (a) is the daily motion in ′s of the transit-progressed M.C. or Asc. by declination. Find (b) the ′s the aspect is from perfect at the time of day represented by the ephemeris positions of the planets on the calendar date. If the aspect is formed before the positions given on the calendar date in the ephemeris, this is a minus EGMT Interval on that calendar day. If the aspect is formed after the positions given on the calendar date in the ephemeris, this is a plus EGMT Interval on that calendar day. From the EGMT Interval find the Standard Time (watch time), or the Local Mean Time, the aspect is perfect at the place where the individual resides according to instructions previously given. Find (a) the daily gain in °s and ′s of the faster moving planet on the slower moving planet either in zodiacal motion or by declination. If the planet is moving to a fixed position, such as 0° N 0′ declination, (a) is the daily motion of the planet. Find (b) the °s and ′s the aspect is from perfect on the ephemeris date, or how far the planet must move to reach the fixed position. By proportion, reduce (a) and (b) to ′s. Multiply (b) by (c) and divide the product by (a). The result is (d). (d) found by either method is the EGMT Interval required for the aspect to become perfect or the required position to be reached. If the aspect is formed, or the fixed position reached, before the positions given on the calendar date in the ephemeris, (d) is a minus EGMT Interval on that calendar day. If the aspect is formed, or the fixed position reached, after the position given on the calendar date in the ephemeris, (d) is a plus EGMT Interval on that calendar day. From the EGMT Interval find the Standard Time (watch time), or the Local Mean Time, the aspect is perfect or the fixed position is reached, at the place for which it is desired to erect the chart or know the time. Example 1. For chart 317c, given on page , calculate all the transit-progressed positions for Jan. 19, 1932, at Greenwich Noon: The positions of all the planets are merely copied from the ephemeris for Jan. 19, 1932. Subtracting the birth-chart position of the Sun, 4S 12° 36′, from the birth-chart position of the M.C., 6S 27° 26′, gives the M.C.C. minus 2S 14° 50′. Changing the algebraic sign before the M.C.C. add its 2S 14° 50′ to the position of transiting Sun on Jan. 19, 1932, 10S 28° 13′, and it gives the transiting M.C. as 13 Aries 03. When 13 Aries 03 is on the M.C. in latitude 30, calculated by the method given in Chapter 2 (Serial Lesson 111), 23 Cancer 16 is on the Asc. This is the transiting Asc. Using the Table of House Cusp Declinations given on page of Chapter 6 (Serial Lesson 115), and the method given on page of Chapter 3 (Serial Lesson 112), we find that when M.C. is 13 Aries 03 it has declination 5 N 09, and that when the Asc. is 23 Cancer 16, it has declination 21 N 26. Example 2. In Chapter 5 (Serial Lesson 114) it was found for chart 317b that minor-progressed Sun was sextile major-progressed Venus on March 1, 1932, when transiting Sun was 10 Pisces 26. At what Standard Time of day at New York was this aspect perfect? 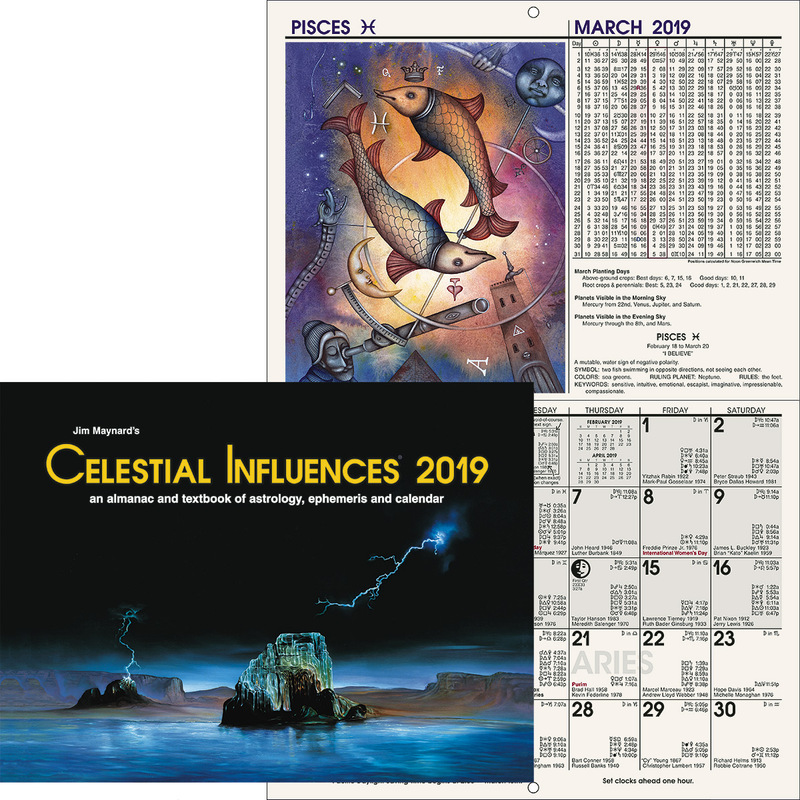 Turning to an ephemeris for 1932, on March 1 we find the Sun in 10 Pisces 43, and thus past the required position (b) 17′. By proportion, multiplying (b) 17 by (c) 1440 gives 24480. Dividing 24480 by (a) 60 gives 408m, or 6h 48m. By logarithms, subtracting log. (a) 1.3802 from log. (b) 1.9279 gives .5477, which is the log. of 6h 48m. Subtracting the 6h 48m found by either method from Greenwich noon gives 5:12 A.M. As New York is Eastern Standard Time zone, 5h West, we subtract 5h from 5:12 A.M. and it gives minor-progressed Sun sextile major-progressed Venus, March 1, 1932, 12:12 A.M. New York watch time. Example 3. In Chapter 5 (Serial Lesson 114) it was found for chart 317b that minor-progressed Asc. was parallel major-progressed Mercury on Feb. 18, 1932, when transiting Sun was 28 Aquarius 58. At what Standard Time of day at Los Angeles was this aspect perfect? Turning to the ephemeris for 1932, on Feb. 18 we find the Sun 28 Aquarius 38, and thus lacking from the required position (b) 20′. By proportion, multiplying (b) 20 by (c) 24h gives 480. Dividing 480 by (a) 60 gives 8h. By logarithms, subtracting log. (a) 1.3802 from log. (b) 1.8573 gives .4771, which is the log. of 8h. Adding the 8h found by either method to Greenwich noon gives 8:00 P.M. As Los Angeles is in Pacific Standard Time zone, 8h West, we subtract the 8h from 8:00 P.M. and it gives minor-progressed Asc. parallel major-progressed Mercury Feb. 18, 1932, noon, Los Angeles watch time. Example 4. When, by Local Mean Time at Chicago, Ill., did Mercury in March, 1932, enter the sign Aries? The ephemeris on March 9, 1932, shows Mercury 29 Pisces 21, and thus lacking from the required position (b) 39′. By proportion, multiplying (b) 39 by (c) 1440 gives 56160. Dividing 56160 by (a) 114 gives 493′, or 8h 13m. By logarithms, subtracting log. (a) 1.1015 from log. (b) 1.5673 gives .4658, which is the log. of 8h 13m. Adding the 8h 13m found by either method to Greenwich noon gives 8:13 P.M. As Chicago is 87:39W. we multiply the 87 by 4 and it gives 348m, and we multiply the 39 by 4 and it gives 156s, or 2m 36s. Adding these two sums gives 350m 36s West, or 5h 50m 36s West. Subtracting the 5h 50m 36s from 8h 13m 00s P.M. gives Mercury 00 Aries 00 March 9, 1932, 2h 22m 24s P.M. LMT., Chicago, Ill. Example 5. At what Greenwich time of day on March 11, 1920, did Mars make the square of Jupiter in the sky? The ephemeris on March 10 1920, shows Jupiter r 9 Leo 03, and Mars direct 8 Scorpio 58. The aspect thus lacks of being perfect (b) 5′. Jupiter is moving daily 5′, and Mars is moving daily 3′. As one is direct and the other retrograde, we add the 5 and the 3, which gives the daily gain (a) 8′. By proportion, multiplying (b) 5 by (c) 1440 gives 7200. Dividing 7200 by (a) 8 gives 900m, or 15h. By logarithms, subtracting log. (a) 2.2553 from log. (b) 2.4594 gives .2041, which is the log. of 15h. Adding the 15h found by either method to March 10, noon, gives Mars square Jupiter in the sky March 11, 3:00 A.M. Greenwich. With the planetary positions given to the ′s position it works out 3:10 A.M.
First find the increment or decrement of the planet during the 24 hours within which its position is to be found. The increment or decrement found by taking the difference in the planet’s daily motion on two consecutive days is that of the planet’s average travel. And this average travel is its precise travel midway between the two noons of each day. Thus starting at midnight with the average increment or decrement, the acceleration increases or decreases as the time is distant from midnight. Therefore, by proportion or logarithms find the increment or decrement at the midway point between noon and the time for which the position is to be calculated. Add the increment thus found, or subtract the decrement thus found, to or from the daily motion of the planet. Then use this as the average gain (a) and solve the problem in the ordinary way. Example 6. For chart 318c, calculate the precise occupied by the Moon, making due allowance for acceleration. On Nov. 24, 1920, the Moon’s position is 10 Taurus 36, while on Nov. 23 its position is 26 Aries 30. Its daily motion between these two days is 14° 06′. Its daily motion between Nov. 24 and Nov. 25, however, is 14° 30′. The amount of increment during 24 hours is thus 24′. The 14° 30′ is the rate of its travel Nov. 24 at plus 12h Greenwich. We desire the position of the Moon for plus 12h EGMT Interval. The position given in the ephemeris for noon is 10 Taurus 36. We want its increment at the midway point between noon and plus 12h, or at plus 6h. Plus 6h after noon is 18h after Nov. 23 at plus 12h, or it is 6h before Nov. 24 at plus 12h. The daily increment difference between the Moon’s travel on Nov. 23 and Nov. 24 is (a) 24′. By proportion, multiplying (a) by (d) 360 gives 8640. Dividing 8640 by (c) 1440 gives (b) 6′. By logarithms, adding log. (a) 1.7781 to log. (d) .6021 gives 2.3802, which is the log. of (b) 6′. Subtracting the 6′ increment found by either method from the 14° 30′ travel of the Moon on Nov. 24 at plus 12h, gives the average travel at midway point between noon and plus 12h as 14° 24′. Without allowing for acceleration and calculating in the ordinary manner (a) is 14° 30′. Using this daily motion gives the Moon’s position as 17 Taurus 51. But allowing for acceleration (a) is 14° 24′. This gives the position of the Moon more precisely as 17 Taurus 48, which is the position given it in charts 318, 318b and 318c. First find the increment or decrement of the planet during the 24 hours within which the time of its position is to be found. The increment or decrement found by taking the difference in the planet’s daily motion on two consecutive days is that of the planet’s average travel. And this average travel is its precise travel midway between the two noons of each day. Thus starting at midnight with the average increment or decrement, the acceleration increases or decreases as the planet is distant from midnight. Therefore, by proportion or logarithms find the increment or decrement at the midway point between the planet’s position at noon and the given position. Add the increment thus found, or subtract the decrement thus found, to or from the daily motion of the planet. Then use this as the average gain (a) and solve the problem in the ordinary way. Example 7. When, in March, 1920, making due allowance for acceleration, does the Moon enter the sign Aquarius? On March 14, 1920, the position of the Moon is 12 Capricorn 44, and on March 15 it is 24 Capricorn 53. Its daily motion is thus 12° 09′. Its daily motion between March 15 and March 16 is 12° 24′. The amount of increment during 24h is thus 15′. The increment on March 15 at noon is ½ of 15 or 8′. The motion at noon, therefore, is 8′ less than the 12° 24′ daily motion, or 12° 16′. Reducing the daily motion, the 12° 24′ become 744′. Dividing the 744 by the daily increment, 15′, gives 50′ travel by the Moon for each 1′ increment. At noon March 15, 1920, the Moon lacks 5° 07′, or 307′ of entering the sign Aquarius. Dividing 307 by 50 gives the increment at the time the Moon enters Aquarius as 6′ more than its increment at noon. As we want the increment midway between noon and this position we divide the 6 by 2 and it gives 3′. Adding this 3′ to the 12° 16′ travel at noon gives the average travel for the 5° 07′ as 12° 19′. By proportion, multiplying (b) 307 by (c) 1440 gives 442080. Dividing 442080 by (a) 739 gives (d) 598′ or 9h 58′. By logarithms, subtracting log. (a) .2897 from log. (b) .6712 gives .3815, which is the log. of (d) 9h 58′. Adding the 9h 58m found by either method to noon gives Moon 00 Aquarius 00 March 15, 1920, 9:58 P.M. Greenwich time. A solar revolution is a chart erected for the moment the transiting Sun returns to the same sign, °, and ′ of the zodiac it occupies in the birth chart. The chart should be erected for the latitude and longitude occupied by the person at that time. Our research department has not found solar revolutions reliable in indicating what will transpire during the following year. But the time of the Sun’s transit thus over its birth-chart position is a creative period of value. Example 8. For what Standard time of day at Los Angeles, California, in 1932, should the chart for a solar revolution relative to chart 317c be erected? July 4, 1932, the ephemeris shows the Sun 12 Cancer 16, and thus lacking from the required position (b) 20′. The daily motion of the Sun is (a) 57′. Solving the problem in the ordinary way shows that to move (b) 20′ the Sun requires 8h 25m. From 8:25 P.M. Greenwich time, subtract the 8h Standard time difference of Los Angeles and it gives transiting Sun conjunction Sun r July 4, 1932, 0:25 P.M., Pacific Standard Time. When the transiting Moon makes the conjunction with its birth-chart place is one type of lunar revolution. The other, and more creative period, is when the transiting Moon makes the conjunction with the birth-chart position of the Sun. In either, the chart should be erected for the latitude and longitude occupied by the person at that time. Our research department has not found lunar revolutions reliable in indicating what will transpire during the following month. And it has not found that the house of the birth chart occupied by the New Moon is of more significance than ordinary transit positions. After doing a great deal of research on this matter it has found that an eclipse of Sun or Moon falling on a birth-chart luminary or other birth-chart position is of no more significance than a heavy transit. To find the time for erecting a lunar cycle, find the time the Moon reaches the cycle position just as in calculating when an aspect is perfect, or a planet reaches a given position, as illustrated in examples 2, 3, and 4. A diurnal revolution is a chart erected for the moment the Asc. 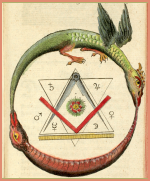 on the given day reaches the sign, °, and ′ of the zodiac occupied by the Asc. in the birth chart. The chart should be erected for the latitude and longitude occupied by the person at that time. Our research department has not found diurnal revolutions reliable in indicating what will happen during the following day. Examples of finding the time of day for which to erect a chart to give a selected sign, °, and ′ on the Asc. are given on pages 249 and 251 of Chapter 8 (Serial Lesson 117). July 4, 1920, 5:00 p.m. CST. 90W. 30N. L.D. Jan. 19, 1920. M.C.C. minus 2S 14° 50′. Solar Constant, minus 7S 9° 55′. Major progressions in first outer circle for Jan. 19, 1932. Minor progressions in second outer circle for Jan. 19, 1932.. Transit progressions on outside for Jan. 19, 1932. 1932: Jan. 9, Mars t opposition Sun p.
1932: Feb. 7, Venus t trine Sun p.
1932: Feb. 15, Mars t conjunction Moon r.
L.D. March 22, 1920. M.C.C. minus 0S 5° 32′. Solar Constant, minus 5S 1° 45′. Major progressions in first outer circle for March 22, 1937. Minor progressions in second outer circle for March 22, 1937.. Transit progressions on outside for March 22, 1937. 1937: July 2, Jupiter t square Asc. p.
1937: July 25, Sun t square Mars p.
1937: Aug. 6, Mercury t conjunction Saturn p.
November 24, 1920, 6:00 P.M. CST. 90W. 39N. Solar Constant, plus 6S 14° 39′. Major progressions in first outer circle for May 24, 1941. Minor progressions in second outer circle for May 24, 1941.. Transit progressions on outside for May 24, 1941. 1941: April 2, Saturn t square Neptune p.
1941: June 11, Mars t conjunction M.C. p.
1941: June 18, Uranus t trine Mars r.